Super close to downtown Boston with enough climbs to keep everyone happy for many repeat visits. 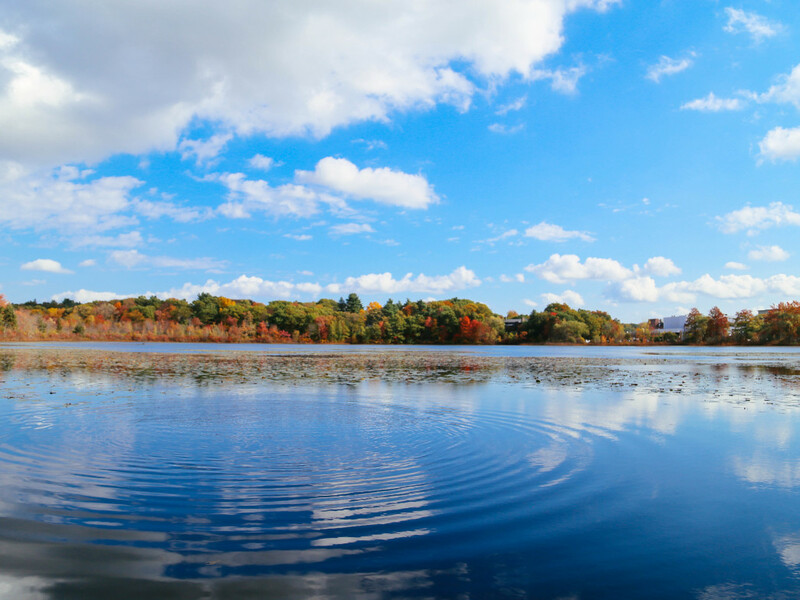 Located a mere 20 minutes southwest of downtown Boston in the city of Newton, Hammond Pond Reservation is a fun local spot if you want to get some quick climbing in- maybe a morning session before the Sox or Bruins game starts? Visiting Hammond Pond will have you climbing on puddingstone, a dark conglomerate rock filled with pebbles. Puddingstone, which is also called “quartz conglomerate” climbs in a very unique style, which many climbers who are used to traditional granite, limestone, or sandstone can have a little difficulty getting used to right away. There are a fair amount of boulders in the area, some of which may be safer to climb with traditional gear or on a top rope, but most allow for good quality climbing, regardless of or height. Climbers looking for a quick lunchtime or afternoon session will love Hammond Pond. While hiking around Hammond Pond, be sure to check out the Alcove, which has plenty of moderates to keep you busy for an afternoon of climbing. "Hammond Eggs" (V1), "Kellogs" (V2), and "Breakfast of Champions" (V3) are just a few of the climbs a visiting climber may find interested to check out. It is worth mentioning that due to the nature of the rock in which is was created, it is not uncommon for small pebbles or even holds to break off on the less popular rock climbs. Be wary of this and exercise preventative measures- pull straight down on holds, bring an extra crash pad, and climbing with a partner never hurt anyone. Getting to Hammond Pond is a piece of cake. For transportation via public transit, take the green line (D) to Chestnut Hills. By car, take Route 9 west to the Hammond Pond Parkway Exit and park behind the shopping center. Half of the crags are found in between the Parkway and the Pond, while another large chunk are found just off of Beacon St. and the Parkway. Most of the land that you will be climbing or hiking on is owned by the Massachusetts Department of Conservation and Recreation, which is free to use and open year round. 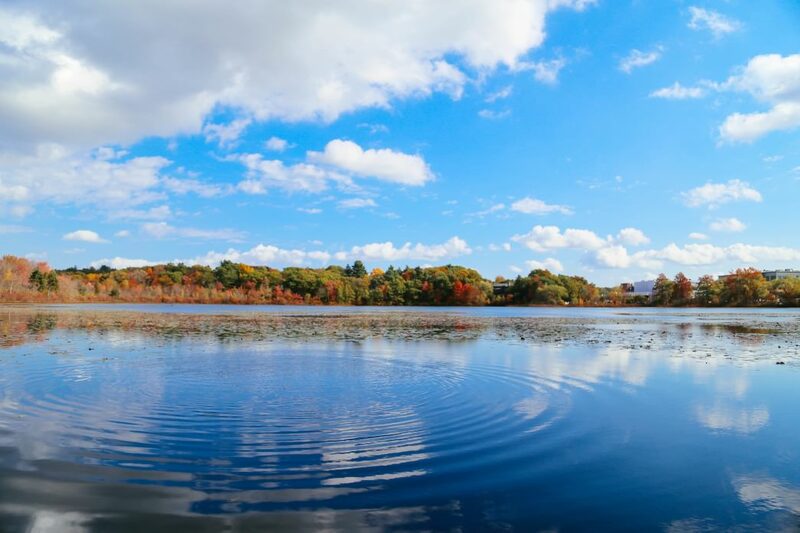 There are no buildings or public facilities to use throughout the park, but should you find yourself in need of additional information, the Hammond Pond Parkway phone number is 617-333-7404. Hammond Pond is a great place to go on a day adventure, especially for folks who may not be up to long drives out to the western part of the state or across the border to New Hampshire. The climbing here is fun and unique, especially considering its proximity to Boston proper. Be sure to check it out on a brisk autumn day for the full New England experience!